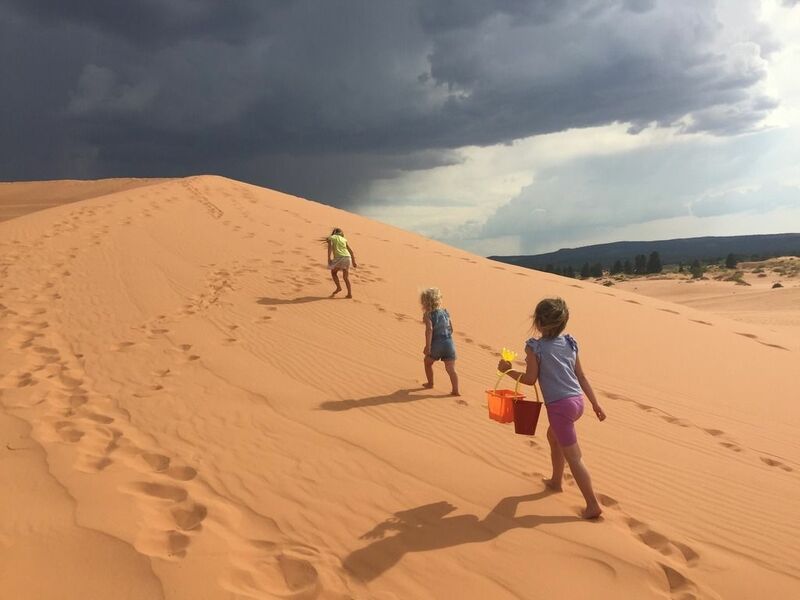 Last week due to a series of interesting events I found myself southbound on Highway 89 towards Kanab with my three daughters in the back seat of our van, Dragon's Breath. We branded it: Girls Adventure. Our first stop (outside of the every-50-miles-bathroom-break) was Coral Pink Sand Dunes, about four hours south of Provo. My Ever, at six years of age has anointed herself Queen of All Sand Dunes. So this particular adventure was for her as all good queens must take time to visit their constituency at least once in a lifetime. When we arrived at the State Park we poured out of Dragon's Breath with eagerness. 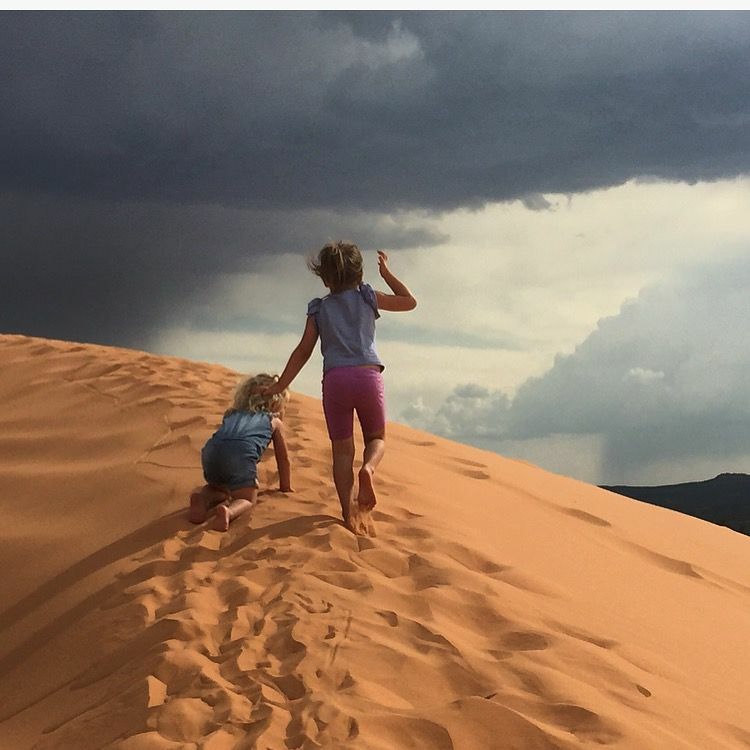 I spotted a huge desert thunderstorm across the pink valley and said a mother's prayer that our exploits wouldn't be rained out. The State Trooper assured me the storm was headed southeast. "We haven't had rain here for days." A short path lead us to the sea of sand. (Utah does have oceans, you know, they're just full of grains of earth and not salt water. But you can still float on them. And the sensation is strangely the same.) The vista was tremendous, piles and piles of pink sand hills, and 200 yards away from our observation point was a mammoth mountain of sand. "Please bless these girls won't want to hike it," was my second mother's prayer that day. "Let's go hike that mountain!" Four-year-old Erin said, and they all took off with shovels and pails in hands, feet discarded of shoes, hair blowing in the distant storm's residual wind. Oh the enthusiasm! I did not create a single female human who doesn't lack enthusiasm. So help me. I followed their little bodies as they ran straight towards the mass, the mountain was somewhat three tiered. We climbed the first tier with some slight huffing. But by the second tier the two year old Iris, (still known as--and perhaps forever--"the baby") was floundering. Sand hiking is its own complicated sport. When the surface under your feet constantly sinks as you try to ascend it can make you feel like you're in a hamster wheel, going no where fast. I heard a cracked little voice behind me, "I follow your footsteps, Mom." Placing her feet into my indentation made walking in the squishy sand easier for Iris. Erin trailed behind her. Ever, her majesty, scaled towards the top in front of us. 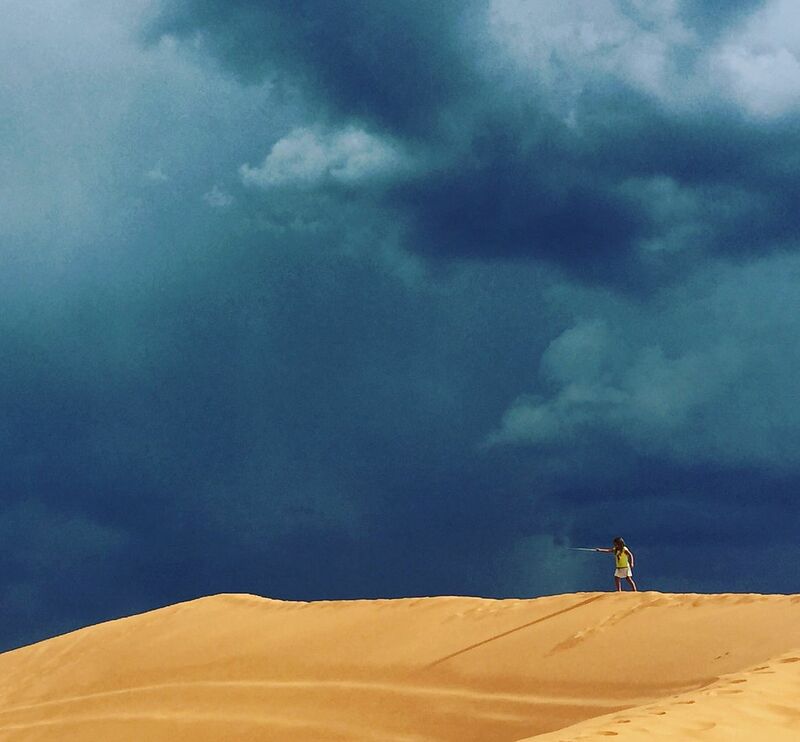 The storm was coming closer and for a minute I entertained the thought of a wind storm in the middle of a sand dune. We would be crushed. Was I being safe? I insisted we all stop for water breaks. The wind was picking up and we could see rain falling from the sky to our south. We were breathing heavy. Our faces red with blood. Pink sand crusted onto our faces where water had dribbled onto our faces from the water bottle. "Should we stop?" I asked them. And they picked up the trail and carried on to the top. Ever first, with a desert reed she had plucked out of the sand islands--they call them--spots of persistent plants in the sea of sand. Behind me, Erin and Iris at the tail end. We hiked silently with hard breaths. Storm clouds and thunder closing in. To the top we made it one-by-one single file. We sat surveying the entirety, chests pumping, hair sweeping around our heads. Pink sand piles for miles. The desert in purples and reds, dotted with greens and sage. A grand kingdom to be sure. We stayed at the top for an hour or so, slid up and down, high jumped, crawled and rolled. A trickle of tourists speaking a host of languages would pass us by, weighted down by heavy camera equipment around their necks. We watched the blue storm sail off to the south. We immersed our body parts until they were "baptized" as Ever called it. We talked about how strong bodies come in all shapes and sizes and the point really was to know the thrill of exploring the folds of our planet. Then we played martians (because other planets are cool too). We walked back slowly, Ever and Erin declared they were a velociraptor and dilophosaures coming back from their rocky graves to haunt me and the baby. The baby stayed the course. And suddenly we were back in Dragon's Breath headed to our next stop. Pink sand in every corner of our tired bodies. There's metaphors in here I know. But why ruin a perfectly good story of adventure?